One of my favorite authors is Nita Leland. All of her books challenge you to think about color and design in ways that stretch your current repertoire. 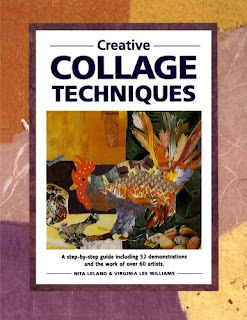 Creative Collage Techniques is the very best book on the market for people who want to learn many many many different ways to approach collage! There are other good books out there, but this is my top pick. It is also relatively inexpensive in comparison to some newer books that don’t offer nearly the depth of this one. Happy happy joy joy too! I found that Nita has a blog. Now we can keep up with this remarkable and energetic artist and have an inside track on new projects!